I’ve a bit of a love/hate relationship with ebooks. Well, I should be more specific – ebook readers. While I’ve fallen hard for them, they just want to run away from me. Last year, my girlfriend got me a Sony PRS-505 for my birthday. Up till then I’d been I’d been skeptical of the whole thing. Concerns about battery life, size and ease of use all turned out to be non-issues. In fact the battery life was fantastic with it only needing a charge every couple of weeks, the e-ink screen was a joy to read on and it was perfectly weighted and sized for my hands. This all tragically came to an end when I swapped it for a banana. Obviously not deliberately – I put it down in the Spar in Northwood when I was getting my daily banana and walked off. It wasn’t until I was getting ready to go home that I realised it was missing. There, of course, wasn’t a sign of it in the shop and none of the staff had seen it. I’d been humming and hawing about getting a new reader and then a few months ago, a friend of mine mentioned someone in her office was selling one second hand for €100. I jumped on it and got myself a practically new reader for less than half price. There was a bit of fiddling around with it to get it up and running (I discovered the 505 doesn’t work with Macs and had to dig out my Windows laptop) but after an hour or so all my ebooks were on it. This apparently is a common problem with the 505 – a knock on the screen breaks some of the lines. I looked into getting the screen replaced but it’d cost more than I paid just to get the part never mind the labour. So over €300 spent to read about €200 worth of books. I was going to throw in the towel and just get paperbacks and the dust be damned. Then the shiney struck. The iPad. Of course I could justify buying one so I could start development for it but really, it was always going to because it was a shiney toy. I’ve 3 ebook readers on the iPad now – iBooks, Stanza and the Kindle app. I despise the twee graphics of iBooks. I hate the horrid looking virtual bookshelf interface. I don’t want to have to swipe to change pages on a regular basis. I don’t want screen space wasted on making it look ‘real’. I’ve not used Stanza much yet, but it already wins over iBooks because it has none of the cretinous rubbish in iBooks. The Kindle app has gotten the most use so far, mainly because I was able to buy the book I wanted (The Temporal Void) straight away. The easy of that has won it points over the 505. The actual reader does what I want – minimal wasted space and page turning by pressing the left and right edges. I’m not convinced that the back lit screen is going to do my eyes an good, but I’ve had no glare problems yet so I’m happy enough. The iPad itself is a bit heavy to hold an just slightly too large to hold comfortably. Since I do a lot of reading in bed, it’s been a small change to find a comfortable reading position. Propping it up in its case though is an ideal solution for me to read while eating. 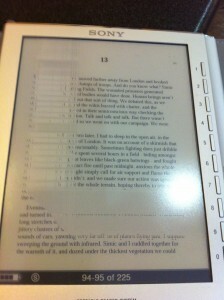 For the time being anyway ebooks are going to replace the physical objects. Only time will tell if I get a nice piece of fresh fruit or just an expensive repair bill this time round.